Today I visited my friend Myra for a new hair style. She owns The Charlemont in Kingsport, TN. 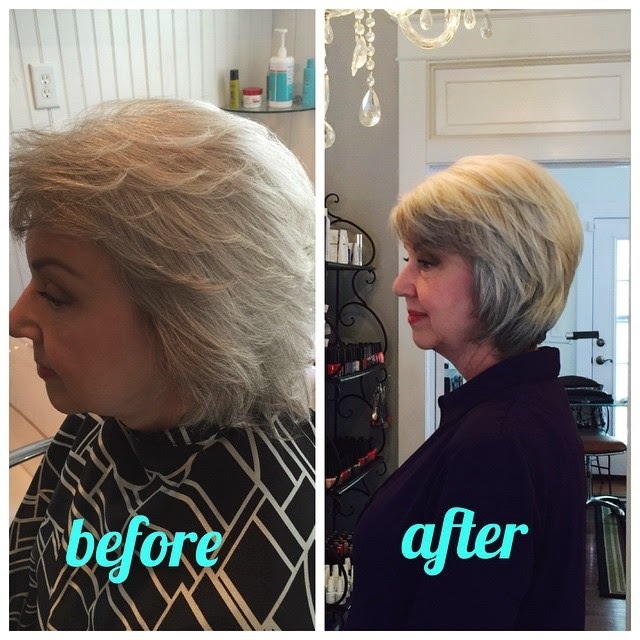 Charlemont is a great boutique but there is also a salon with full services as well. My hair is always unruly in summer so Myra suggested a new modified bob style that could be blown out straight or in its natural state of waves. My hair is still dark underneath so we are going to do some blending lowlights next time. This shot taken later in the day is what it will look like most of the time. Windblown and a bit messy is more me. Win a Covered Perfectly Top! I love to give you gifts so I am very grateful to Pauline Durban, owner of Covered Perfectly for hosting another giveaway. You can win the top of your choice from her beautiful line of very comfortable tops. Congratulations Mary Wooten from Indiana! You are the winner of a Covered Perfectly top of your choice! Be sure to check out all the new styles and colors at Covered Perfectly! There are even some new prints! You can save 20% on up to two items when you use this discount code FNF20. 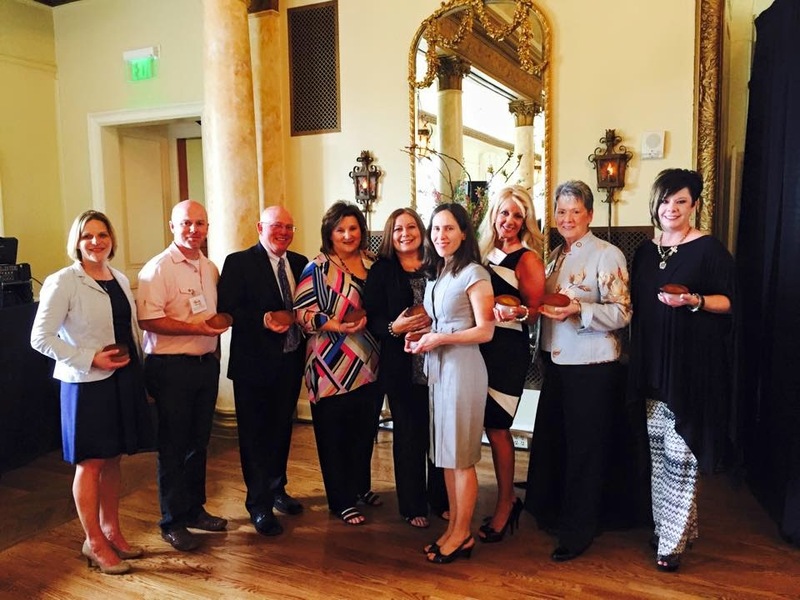 The 2015 Tri-Cities Go Red for Women Luncheon was held in Kingsport this week. Go Red for Women's Circle of Red is a powerful, passionate group of people dedicated to making an impact in our community's fight against heart disease. Heart disease is the No. 1 killer in women. Yet, only 1 in 5 American women believe that heart disease is her greatest health threat. Learn more about how to prevent heart disease here. Advocate for healthier hearts, starting with your own. Spread the word by sharing what you know about heart health with other women. Support Go Red For Women with your time and resources. Khaki pants can be the perfect casual element. When we are going out to dinner with friends to a very casual restaurant I find that a nice pair of khaki pants will usually serve me well. Denim sometimes seems too casual and black always feels dressed up even when the pants are jeans. Last night I wore a great pair of sleek pull on khaki pants from Fabrizio Gianni. The wide waistband and no zipper mean the waistline is smooth and flat. The black V-Neck top is by Tahari from T.J.Maxx. The necklace is several years old from Chico's. The jacket is by Peter Nygård from Dillard's. The shoes are old by Louise Et Cie from Nordstrom. The bag is from Finley House Couture in Blowing Rock, NC. When I invest in pieces that fit well and are of good quality, I can enjoy wearing them in a variety of ways over the years. Solid colors make it easy to mix and match. Our local Chico's store recently had a full week of special events. I was asked to model in the store on Saturday. Everything was on sale so lots of people came out to shop! I loved meeting and helping some of the clients who came in to get tips. We talked about how to use the correct texture and style of accessories to complement your personal features. For example, while the scarf above is lovely, the bold sleek silver necklace is a much better choice for my cool coloring and rounded features. I was so happy to see my sweet friend Rose Sorrell! This is a great time to shop at Chico's! The selections are good and there are still some sales going on. 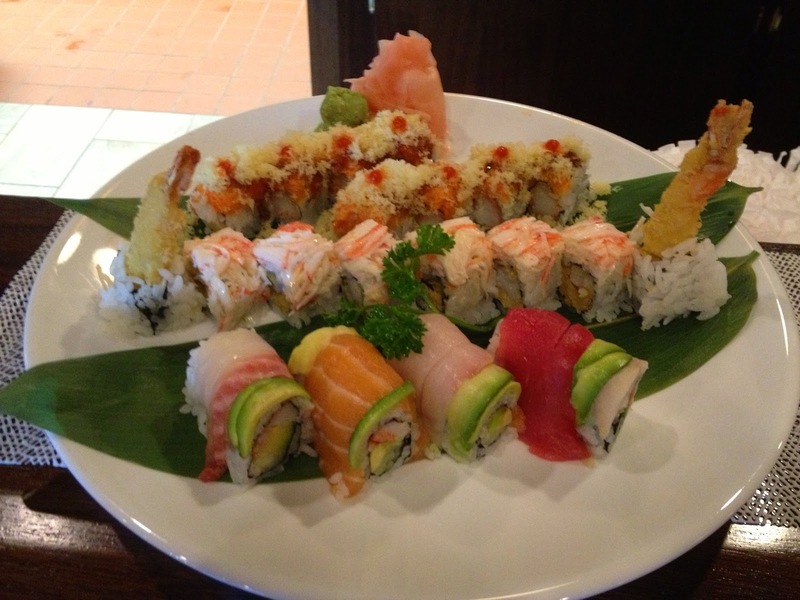 Last night Mr. Mickey and I had sushi at Ming's Aian Cuisine here in Johnson City. Do you like sushi? They have very good fresh and beautifully presented rolls. This is a photo from their Facebook page. We had about half this much! I was busy all day with meetings, another fundraiser, and other projects so I wore black ankle pants and a mesh hem black tank with an antique white boyfriend blazer and jewelry, all from Chico's. The shoes are by Ivanka Trump via Nordstrom. The quilted chain bag is from Express. The sunglasses are Kenneth Cole from T.J.Maxx. I will be modeling for Chico's in the Johnson City store on Saturday again. Please stop by if you can! I don't work for them, but I do love their clothes and accessories so I am often asked to model for the local stores. It is great when you can find clothes that work together over the seasons year after year. Chico's colors and styles serve me well with my busy lifestyle. 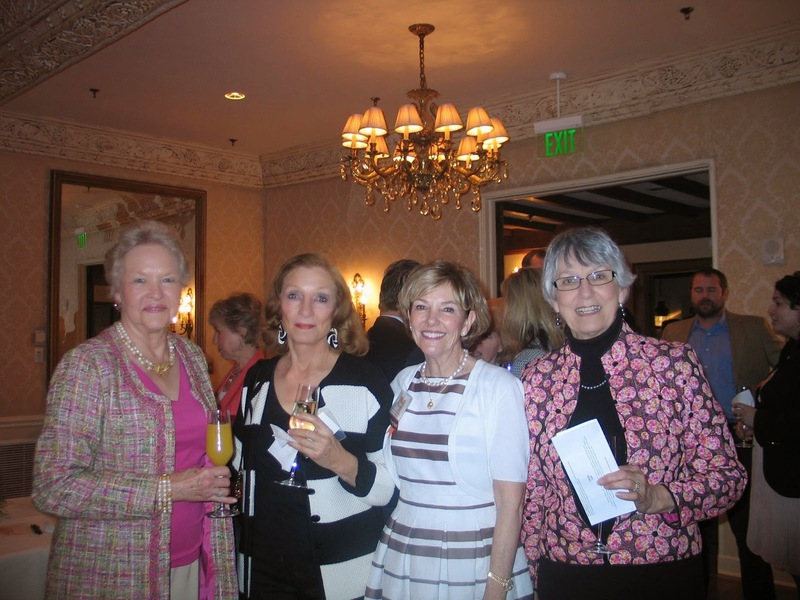 The Women's Fund of East Tennessee recently held our 4th annual luncheon at the Cherokee Country Club in Knoxville, TN. The mission of the Women's Fund is to be a catalyst to transform the lives of low-income women and girls in East Tennessee Foundation's 25-county service area. Congratulations to the grant recipients for 2015. 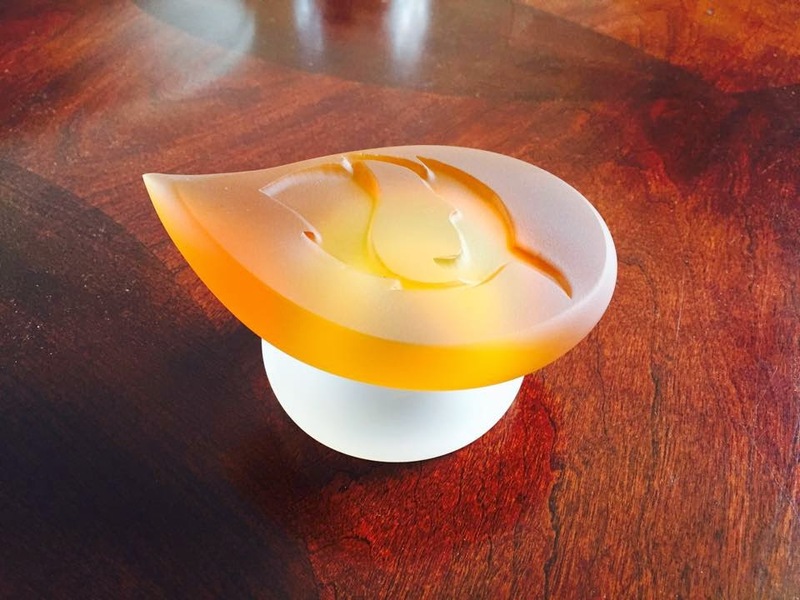 The Women's Fund award created by world renowned glass artist Tommie Rush. 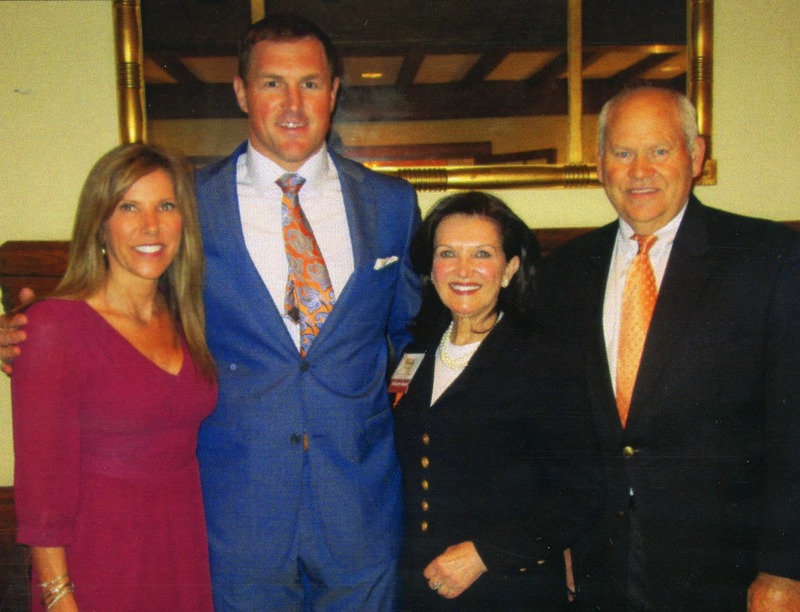 Michelle Witten and guest speaker, Jason Witten, Brenda Wood and Coach Phillip Fulmer. Some of my beautiful lady friends are Mary Powell, Ann Reel, Kay Clayton, and Carol Transou. 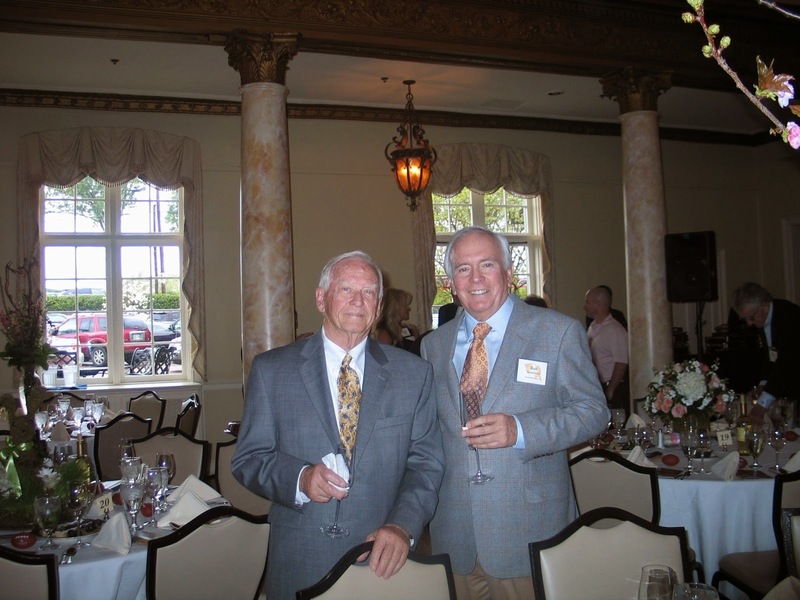 Sweet gentleman friends, Doug Sizemore and Rab Summers. This year I wore cobalt blue with black with silver jewelry, all from Chico's. Many of you have asked for tips on what to wear in warm weather. Here in east Tennessee we rarely have the hot humid weather I experienced while I lived near New Orleans. This loose thin almost sheer blouse is a Portofino blouse from Express. I have them in many colors and wear them throughout the summer with faded jeans, white jeans and khaki pants. I buy them in a size larger than I normally wear so that they are roomy enough in the bust. I hate when the gap happens! I am wearing this fuchsia one as a tunic, but I often tuck in some of the front and wear a cute belt to look a little more stylish. On this day, I was on my way to the grocery store. The ankle length slim leg jeans are from Chico's. The wedge sandals are by Antonio Melani via the sale rack at Dillard's last fall. The bag is by Alberta di Canio and I bought it at T.J.Maxx last year. The Kenneth Cole sunglasses are also from T.J.Maxx.